Kettles used to be simple things that boiled water, so you could make tea or, I dunno, Bovril or something. Now, thanks to all of us getting richer, at least statistically speaking, they've joined the premium kitchen tech consumer revolution. Though of course you can also still get cheaper ones. All told, there area LOT of kettles available. Many long hours were spent boiling water whilst clutching a decibel meter and stopwatch, testing the pleasingness of the pouring spout, and as far as possible, living with each kettle for a while. At the end of that process we picked out the Sage by Heston Blumenthal Smart Kettle. And since we usually pick Sage stuff to win these tests, that made us wonder why we'd even bothered. 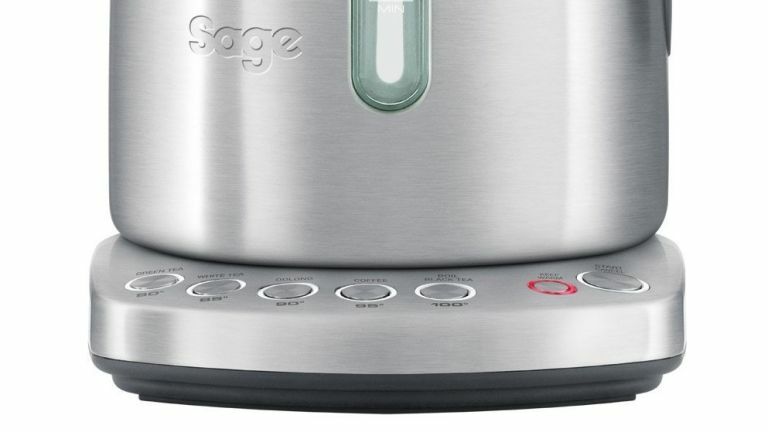 Having subsequently lived with the Sage Smart Kettle for a number of years, we can further confirm that it's still working just great, and is reasonably easy to descale. How does a kettle stand out in such a crazily busy field? Two ways: they can be made of premium materials and look like an industrial work of art. And they can use digital tech so as to have different temperature settings. The latter allow you to make the most of different beverages - coffee requires about 90 to 95 degrees, green tea, which can be literally nauseating when made with boiling water, requires about 80 degrees. Oolong tea requires 90 degrees and white tea about 85. Do you drink oolong tea? Then there you go. Sorted. Now an interesting thing, in our experience, is that a really expensive kettle will not necessarily last any longer than a cheap one. Probably if you tallied up all users around the world, a £100 one lasts longer, but T3.com has had several pricey kettles drop dead after a few months, and we've all owned cheap plastic kettles that lasted for all our student years and well beyond. If you're going high-end, buy from someone who's reputable in terms of accepting returns, like John Lewis or Amazon. At the end of the day, these things are kettles, for heating up water. We know which ones we like, and we'll tell you here. You can judge for yourself whether you like the look, we'll fill you in as best we can how good they are at boiling and dispensing water without scalding you or exploding. It's hot work, but someone's gotta do it. Once you're done, come back and check out the rest of our kitchen tech verdicts, links are above. They're way less boring than kettles, we guarantee. Before you read on, let's answer a few questions. Do these kettles all have removable scale filters? Yes. Do they all have variable temperature control? No, though most do. We've mentioned when they don't. Hey, my variable-temp kettle stops boiling for a while, then restarts when it's heating to a temperature other than 100 degrees! Yes, they all do that. We don't know why. Don't worry about it, guy. Are these kettles ranked in order? Yes, but based on our taste. And let's face it, kettles are not the most difficult things to get at least somewhat right. So browse till you find one you like the look of. We keep giving the Sage range top spot in our kitchen tech lists for several reasons: we like the steeled look, the products feel high-end and offer genuine innovation. Although the pricing is not cheap, it's actually pitched below more established names in the premium small appliances market. So it's almost boring to say it but the Sage Smart kettle is yet another strong, steely and premium-priced product that tops one of our charts. It boils quietly and reliably, has a large, 1.7-litre capacity, looks great for a kettle and has a lid that opens with a pleasingly slow – but not so slow as to be irritating – action. Textbook. The buttons, as on the Sage Smart Toaster, are amusingly quirky. Has there ever been a UK kettle with a dedicated "oolong" button before? Alternatively, you could go for this, which costs significantly less. Admittedly, this lacks multi-temperature settings for your oolong tea, and the stainless steel heft of the Sage by Heston Blumenthal Smart Kettle. Clearly, no slap-headed gastro-scientist in big specs is going to put their name to it (though Russell Hobbs, whoever he is, already has). However, what's undeniable is that it definitely boils water, quickly, has a very smooth-flowing spout, and looks perfectly pleasing from a distance. I'm not quite sure why it's called 'Colours Plus' when it only comes in black or grey, but there we go. From the reliably efficient purveyors of high-end, large kitchen appliances comes this attractive kettle, which looks a bit like a very attentive metal rooster head. It's quick and quiet,though the pointy spout is rather unforgiving and the lid has a tendency to stick. Very solid generally, though. Also about the most affordable AEG appliance there is,if you're feeling aspirational. This is the multi-temp version, which we think it great and easy to use, but they've also got a cheaper, non-variable model. As with its toasters, KitchenAid does two types of kettle: a merely expensive one, and an outrageously expensive one. And again, this - the "cheap" version - is the one we recommend. This cool-looking, 1.7 litre model comes in cream, black, red and stainless steel and has six 'digitally-controlled' heat settings, plus a keep-warm function - which seems like an amazing waste of energy, to us, but if you're a chain-sipper of hot beverages, could be useful. It also has adjustable temperature from 50 degrees to 100 degrees, without the need for a massively bulky base - the controls sit on the handle instead. The spout is wide and effective and it's a reasonably quick boiler, too. The digital beep it emits when docked and on boiling is admittedly rather shrill compared to its more expensive sibling's calming, analogue 'ping', however. Best known for its toasters, Dualit also tries its hand at other appliances, making really excellent hand blenders, and not-bad milk frothers, for instance. Dualit also makes a wide and growing range of kettles, and this is our favourite. It best captures the classic Dualit look of being retro without looking old - timeless, really - and boils quick and fast. The handle allows easy lifting and pouring and the water level gauge is very easy to read. The scale filter is unusually easy to access and clean, too. Sometimes, the simplest tech, done best, is the most pleasing. Shame it doesn't have multi-temperature settings, though. Want a smaller kettle? Here you go! A more affordable Sage kettle, this dispenses with the multiple temperature control and only holds a litre. That's why it's called The Compact Kettle. However, it keeps the same benefits as the pricier Sage devices, being very handsome indeed, quick and quiet to boil, and having an excellent spout and reliable, sproingy lid. This is a great looking kettle, though we found that the lid was a massive pain to use. Like trying to coax a sick man out of bed, it took so long to rise, we had almost lost our appetite for tea by the time it rose. It's also on the noisy side and feels lightweight and cheap but the handle can be gripped easily, even with wet hands. The look remains compelling, however and there's always the fact that you can get it so it matches your kitchen. If you fall in love with the look of this one, perhaps its price tag won't put you off. We find it rather squat and unappetising, and overly self-conscious in its analogue affectations, from the temperature dial on the side to the soft "ping" it emits once the desired, adjustable temperature is reached. On the other hand, the temperature slider is hugely satisfying and covers the widest range of any of these kettles, from 50 to 100 degrees. On the OTHER other hand, our one's lid kept popping up when boiling, and then the pinger stopped working, and it was also kind of loud. Doubtless that isn't what usually happens, and probably most of these work fine, but it does go show that not only will money not buy you happiness, it also won't even buy you a kettle that always works. Now, this looks absolutely magnificent, and has a particularly fetching digital display for its variable temperature settings. It can also hold the water at your chosen hotness, has a clock and, if you please, a timer, so you can have it boil at set times. Why don't more kettles do that? It's not the best kettle, being particularly tricky to pour from. However, this does undeniably make a very strong statement. Even if that statement is, "I am a car nut who values style over substance".